This text was written originally as a chapter for Infinity in a drop. It gives an overview of the terms Sri Aurobindo uses to describe the Self and the structure of the personality. If you are not familiar with Sri Aurobindo’s thought, this text may be difficult to follow. In that case, it may be helpful to first read the Introduction to Infinity in a drop, especially the "Preface" and the chapter on the "Ongoing evolution of consciousness". A much more simple, experiential and student-friendly text can be found in the preceding chapter of Infinity in a drop. 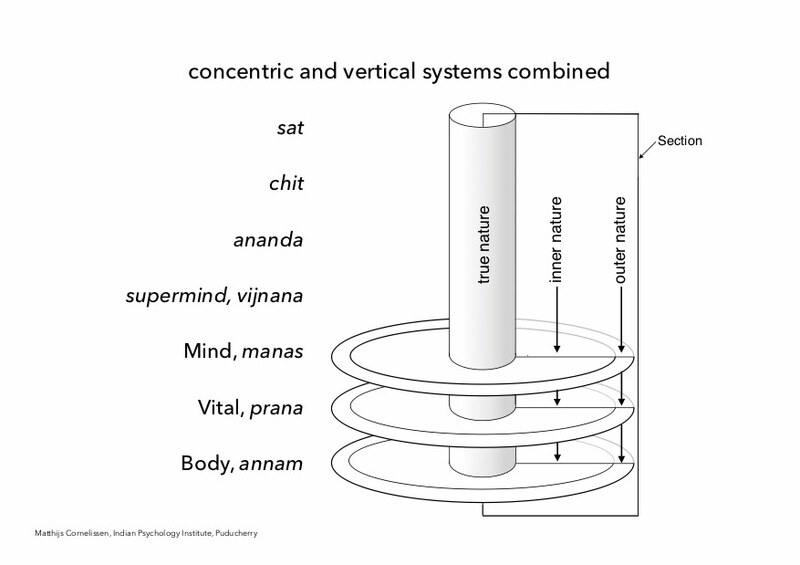 The concentric system is the term Sri Aurobindo uses to describe what one encounters when one ventures inward from the surface nature in the direction of one’s innermost self. In the concentric system, Sri Aurobindo distinguishes three major realms: an outer nature and an inner nature — both part of prakṛti, universal Nature — and an inmost, or true nature, which belongs to the puruṣa, the Self. Outer nature is the term Sri Aurobindo uses for that part of being that a person is conscious of, at least to some extent, in his or her normal everyday life. In this outer nature, physical, emotional, cognitive, and conative elements are all mixed-up together. When a person gets angry, for instance, one’s body and mind tend to be as much involved as one’s feelings. On the surface, thoughts are rarely entirely free from emotional coloring. Bodily states — like tiredness and freshness, illness and health — affect the way an individual feels and thinks; the mind affects the way one feels both emotionally and physically. The unconscious is the true psychical reality; in its innermost nature it is as much unknown to us as the reality of the external world, and it is as incompletely presented by the data of consciousness as is the external world by the communications of our sense organs (p. 607). We are not only what we know of ourselves but an immense more which we do not know; our momentary personality is only a bubble on the ocean of our existence" (p. 576). Inner nature is the term Sri Aurobindo uses for that part of the being which is not fully accessible to an individual in his or her ordinary waking consciousness. The word inner might give the impression that one is dealing only with a small, dark, and purely private territory. According to Sri Aurobindo, the opposite is true: The inner nature (a) is vaster and more luminous than the outer nature; (b) has access to broader and higher ranges of experience and knowledge; and (c) is more, not less, connected to others and the rest of the world (LD, pp. 442, 554–564). Though Sri Aurobindo sometimes uses the word subconscious to describe this part of the human nature, he prefers the term subliminal,2 which indicates that it is that part of a person that is below the threshold of one’s ordinary outer awareness without implying that it is smaller or less conscious than the outer nature. Most people are not aware of what the subliminal contributes to their lives except indirectly through unexplained feelings and changes of mood, through dreams and other special states, or through sudden thoughts and flashes of insight, which the subliminal throws up onto the surface. According to Sri Aurobindo all these contributions from the subliminal are possible because the person, in the subliminal, is connected vertically to layers above and below his or her ordinary awareness and horizontally to other people and to the myriad of forces and beings that surround the person (LD, p. 580, p. 605, p. 681, pp. 761–763). The part of the subliminal that deals with an individual’s own deeper and higher being, Sri Aurobindo calls here the intraconscient. It is through the intraconscient that a person can become aware of those aspects in his or her own nature which one has no access to in one’s ordinary waking state. The intraconscient includes the area that Freud calls the unconscious. But the intraconscient also includes ranges above the ordinary waking consciousness that Freud ignored but Jung explored at least to some extent (Coward, 1985). The part that connects an individual to others and to the play of cosmic forces that exist all around, he calls the circumconscient. It is through the circumconscient part of the inner being that Sri Aurobindo sees most parapsychological perceptions taking place (p. 556–557). Partial glimpses of the inner nature can be experienced through dreams. Dreams are, however, not really the "royal road" that Freud held them to be (2010, p. 604). They are more like incidental cracks in the wall that separates the inner from the outer nature. To explore the inner nature systematically, an expert level of inner observation and training is required that, as has been discussed in the introduction, involves a relocation of one’s center of perception inwards [INTERNAL REFs to knowledge chapters]. People who have not developed this deeper awareness of their inner states and processes will tend to call only their behaviour their outer nature. Whatever else they know of themselves, they will call their inner being. Sri Aurobindo's reference point is much further inside and the little that most people know of themselves is in his terminology all called outer nature (e.g., Sri Aurobindo, 2012, pp. 84-85). What in Sri Aurobindo's terminology is called the inner being is a part of human nature that most people are not aware of at all. For a more detailed discussion of outer and inner, please see the chapter on the borders of the Self in the Appendix. The true being may be realised in one or both of two aspects — the Self or Atman [above] and the soul or antaratman, psychic being or caitya puruṣa [within] (LY-I, p. 07). While the outer and inner natures belong to prakṛti, one’s true being is the puruṣa. Above all planes and worlds, it is the jīvātman who eternally and immutably presides over the manifest nature. The jīvātman is one’s highest individualized essence. Still further above it is the paramātman, one’s true universal essence. Both can be experienced as the true Self — far above the ordinary earthly existence, transcendent, immutable, and eternal if not beyond time. Deep within one’s embodied being, behind the heart is the soul, the psychic entity, which represents the jīvātman in its incarnate existence (LY – I, p. 56 onwards). The discussion will return to these and other aspects of the Self and soul in more detail in a later section on the various centres of identity. A simplified diagram of the concentric system could then look like Figure 1-2-1a. 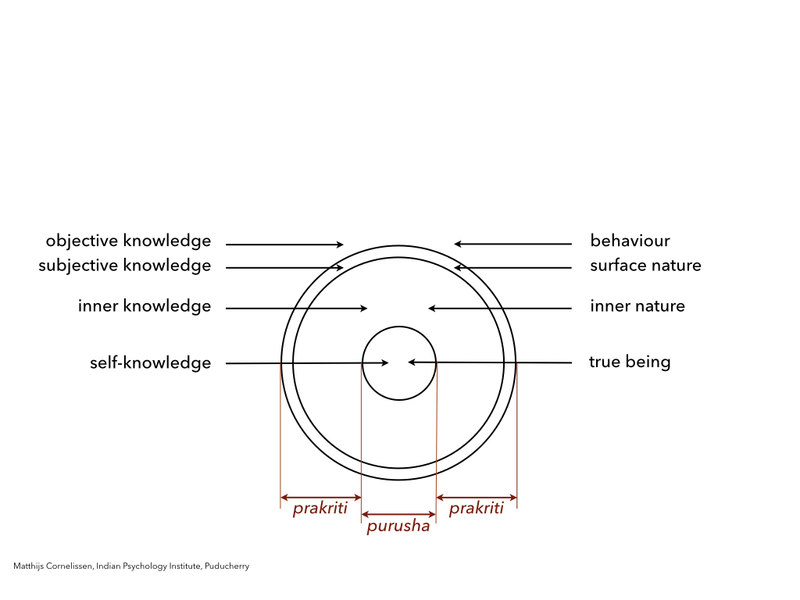 In Figure 1-2-1a one can notice on the right the parts of the nature, and on the left the types of knowledge that give access to them. See Chapter 6 for more details on these four types of knowledge. Appendix 1.2.1 gives some more info on how defective assumptions and methods of enquiry have limited what mainstream psychology can see. Embodied life, in the details of its physical operations, has to follow the laws of physics and inorganic chemistry. But while it does that, it achieves something new that, at least in some aspects, seems to go against the basic spirit of the inorganic, physical reality. Plants and animals, for example, manage to reconstitute their immensely complex structures out of the utterly simple molecules of air, water, and soil in total disregard of physical nature's basic principles of inertia and entropy, its consistent tendency towards the dissipation of energy. As Sri Aurobindo remarked at several places, someone who knew only the purely physical world could never have predicted, or even imagined, the way life has developed on this planet (LD, p. 874; 1999, p. 186). In the mind, one will find an entirely different type of consciousness than that of the vital. The mind, as such, is not interested in self-assertion, though the vital life force may enlist it for that purpose. It is the mind’s job to model reality, and then plan action on the basis of its model. The mind presents reality to itself, thinks about it, uses it to plan action, and expresses its mental constructions to itself and others. One can look at the nervous system — with which the mind tends to identify itself — as an incredibly complicated, multidimensional model-making machinery. Manas, the Sanskrit word that probably comes closest to the English word mind, is in the older Sanskrit texts used for an entire plane or world of mind, the fifth from the top in the Sevenfold Chord of Being (SV, p. 45). In the Taittirīya Upaniṣad (2nd chapter, the “Ānanda valli”) (Radhakrishnan, 2007), it is used for what it calls the sheath of mind, the manomaya kośa. Patanjali seems to use manas in his Yoga Sutras4 rather like we use mind, that is for the individual mental faculty, but it is quite possible that it still has for him the connotation of something with a cosmic (rather than individual) existence (see verse i.35; ii.53, iii.48). In the later Darshanas (schools of philosophy), manas tends to be used in a more restricted way for the sense-mind whose job it is to coordinate the ten indriyas (the five senses and the five instruments of action) (see, for example, Surendranath Dasgupta 1922/2006, I, p. 213). the thought-mind (the mind proper) (p. 350). The habitual mind (also called mechanical mind) repeats itself endlessly and obstinately resists change — in short, the mind under the reign of tamas. The pure ideative mind (also called intellectual truth-mind) consists of thoughts and ideas more or less for their own sake (SY, pp. 669–672). The acceptance of power as part of saccidānanda and the power of the individual soul over its nature are necessary preconditions for the radical transformation Sri Aurobindo envisaged (e.g., Sri Aurobindo, 2012, pp. 174–175). The maṇipūra cakra carries the middle vital with one’s larger ambitions for power and possession. This middle vital is the Hara of Japanese martial arts (see J. C. Markert, 1998). It is also the source of what business people call gut feelings. Significantly, “having guts” means being courageous and daring — qualities that occur when one’s consciousness is powerfully present at this level. The cakras are interconnected through vertical energy channels within the subtle body. Some people spontaneously feel them as streams of force while others perceive them as streams of light. When subtle inner energies open a cakra, the inner powers, or siddhis that belong to that cakra awaken and become available. This awakening can be achieved intentionally, for example, as part of focused hatha and rajayoga practices, but it can also happen spontaneously or as a consequence of other forms of yoga (LY — II, pp. 237–238, 460–464). Besides the Sevenfold Chord of Being and the cakras, there is still one more set of terms that describe states that tend to be experienced subjectively as a vertically arranged hierarchy. They describe levels, or degrees, of awareness. From the bottom up, they are the inconscient, the subconscient, the ordinary waking consciousness, and the superconscient. The inconscient base of the creation Sri Aurobindo also calls the nescient. Our ordinary waking consciousness is limited to a small portion of the physical, vital, and lower mental planes. Most of what happens even on these planes remains below its threshold of awareness. The higher ranges of the mental plane, the supramental, and saccidānanda are entirely superconscient to the ordinary waking consciousness. The words superconscious and superconscient are both used by Sri Aurobindo again with two different meanings. More broadly, they are used for any consciousness that is above the ordinary waking consciousness — in other words, including the higher consciousness or, more specifically, for that type of consciousness that is divine, entirely beyond dualities. Sri Aurobindo does not use the term the unconscious. Freud’s unconscious covers, more or less, what Sri Aurobindo describes above as “a hidden and hooded mental substratum into which past impressions and all that is rejected from the surface mind sink” (LD, p. 762). 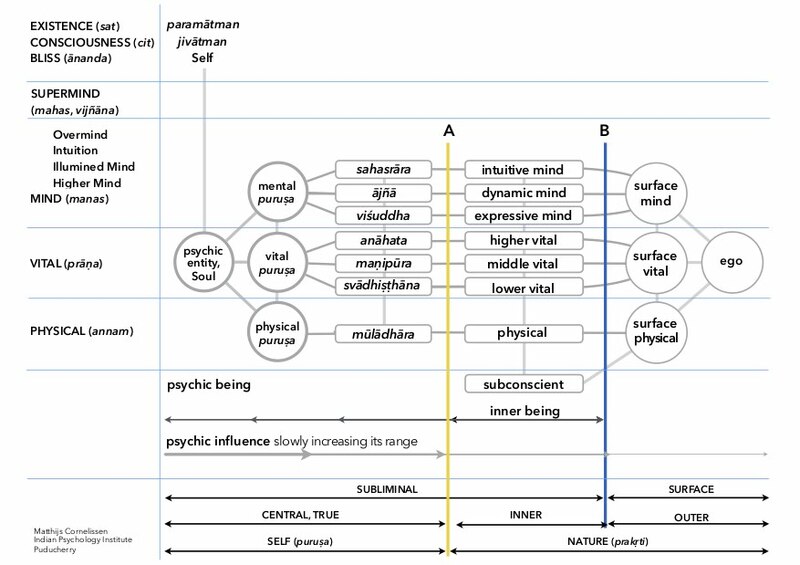 Jung’s unconscious contained more positive formations, like, for example, his archetypes. In that sense it has some overlap with Sri Aurobindo’s subliminal. As was mentioned earlier, the location of the border of the self is perpetually shifting and in a person's ordinary waking consciousness it can include not only the individual's body, mind, and personality, but even possessions, roles, group-memberships and whatever else one identifies with at a given moment. What is more, both the average and the ideal location for the border of the self differ, not only between individuals but also between (sub)cultures — think for example about the degree to which one's sense of self can include one's small family, extended family, caste, company, class or country. Some spiritual traditions in India recommend to place the borders of the self radically further inside. For example, in Sāṁkhya, the philosophy supporting hatha and raja yoga, the true Self or puruṣa contains only pure consciousness, while the personality and all mental processes are considered to belong to universal Nature, prakṛti (Hiriyanna, pp, 270-280). There is, however, not only a Self above the manifest reality, but there is also a distinct Self, or puruṣa, on each plane or level of consciousness. These plane-specific Selves function as the true center of one’s conscious existence on that level. So, the central being contains an annamaya puruṣa, a prāṇamaya puruṣa, and a manomaya puruṣa. On each of the three manifest lower planes (physical, vital, and mental), one can find, besides this plane-specific Self, also plane-specific aspects of the inner and outer nature. The combination of a self, in the most generic sense of a center of consciousness and identity, with a corresponding part of nature, Sri Aurobindo calls a being. So, within the human individual, one can speak of an inner and an outer physical being, an inner and an outer vital being, as well as an inner and an outer mental being.6 In the outer nature, one is generally not aware of the true Self, and as a result, there is a tendency to operate under command of some more superficial, ego-based center instead. The inner nature comes more easily under control of one’s true Self. For example, the outer mental being is likely to be guided mainly by a mental ego, while the inner mental being is more likely to have the mental Self as its center. Sri Aurobindo speaks about a true being when on one of the planes, one’s nature is fully under the conscious control of the true Self of that plane. The true mental being, for example, describes the (part of the) mental nature that is fully under conscious control of the mental puruṣa. To make it easier to visualise the relationships between the various concepts discussed so far, I will now put some of them together into three diagrams. The reader may keep in mind that reality is always much more complex than the models that can be made of it, and these diagrams are intended only to depict in graphic form how the different parts of the personality conceptually relate to each other. They are not intended to depict reality in any other way. Figure 1-2-4a indicates how the concentric system (depicted in Figure 1-2-1a) intersects with the three planes of the lower hemisphere: the physical, vital, and mental. The vertical sheet labeled “Section” on the right side of Figure 1-2-4a serves as the backdrop for the conceptual relationships indicated in Figure 1-2-4b and Figure 1-2-4c. Figure 1-2-4b indicates the most prominent elements of human nature together in a simple, two-dimensional diagram. The ego and the outer nature are on the right. To indicate that in the outer nature the distinction between mental, vital, and physical is not as clear as it is in the inner being, the borders have here been indicated in grey. The only thing that stands out in the outer nature tends to be the ego. 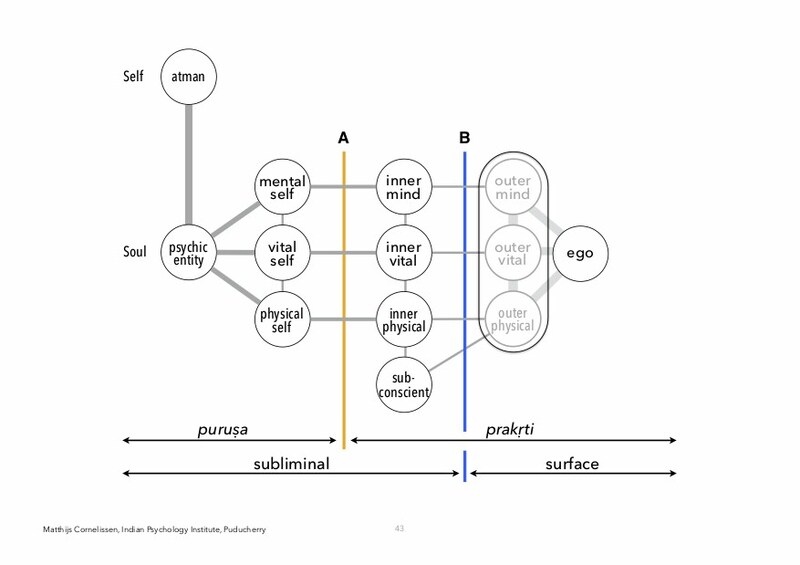 Another important issue that has been made visible even in this highly simplified diagram is that the inner nature, which in mainstream psychology would be counted under the self, in Indian systems like Vedānta and Sāṁkhya is unambiguously part of prakṛti, the non-self. For a more detailed discussion of what is considered outer and inner in different contexts, please see the chapter on the borders of the Self in the Appendix. As discussed in more detail in the chapter on the three main concepts of consciousness [INTERNAL REFS], the acceptance of power as part of saccidānanda and the acceptance of the power of the individual soul over its nature are necessary preconditions for the radical transformation Sri Aurobindo envisages, but by themselves they are not sufficient. Two more things are needed. On the individual level, the soul should be able to retain some kind of individual spiritual identity even after reaching mokṣa (liberation), nirvāṇa (extinction) or whatever else the entire loss of the egoic or ignorant self may be called. The second condition is that there should be at least the beginning of a genuinely divine collective life. 2. Latin sub, below + Latin limen, threshold. Dalal, A. S. (Ed.). (2002). Emergence of the psychic: Governance of life by the soul. Selections form the works of Sri Aurobindo and the Mother. Pondicherry, India: Sri Aurobindo Ashram. Feuerstein, G. (1979/1989). The Yoga Sutra of Patanjali: A new translation and commentary. Rochester, VM: Inner Traditions India. Iyengar, B. K. (1993) Light on the Yoga Sutras of Patanjali. New Delhi: HarperCollins. Markert, C. J. (1998). Dan-Tien: Your secret energy center. York Beach, Maine: Weiser Books. Sri Aurobindo (Aurobindo Ghose). (1998b). The secret of the Veda. In Complete works of Sri Aurobindo (Vol. 15). Pondicherry, India: Sri Aurobindo Ashram Publication Department. Sri Aurobindo (Aurobindo Ghose). (2001). Record of Yoga. In Complete works of Sri Aurobindo (Vols. 10–11). Pondicherry, India: Sri Aurobindo Ashram Publication Department.